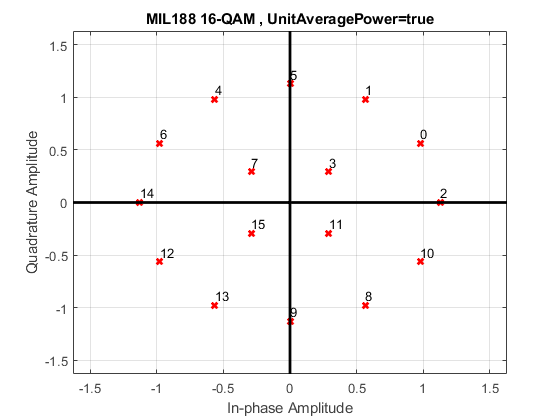 y = mil188qammod(x,M) performs QAM modulation on the input signal, x, in accordance with MIL-STD-188-110 and the modulation order, M. For more information, see MIL-STD-188-110. y = mil188qammod(x,M,Name,Value) specifies options using one or more name-value pair arguments. For example, 'OutputDataType','double' specifies the desired output data type as double. Specify name-value pair arguments after all other input arguments. Modulate data using 32-QAM as specified in the MIL-188-110C standard. Display the result using a scatter plot. Set M to 32 and create a data vector containing all possible symbols. Modulate the data using QAM as specified in MIL-STD-188-110C. Display the constellation as a scatter plot. Modulate data using 16-QAM as specified in the MIL-STD-188-110B standard. Normalize the modulator output so that it has an average signal power of 1 W.
Set M and generate random data. Modulate the data applying 16-QAM as specified in MIL-STD-188-110B. Using name-value pairs, set the unit average power to true and enable the constellation plot. Verify that the signal has approximately unit average power. Modulate a sequence of bits using 64-QAM as specified by MIL-STD188-110B. Display the constellation. 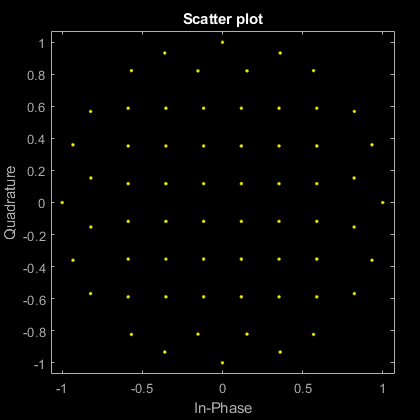 Set the modulation order and generate a sequence of random bits. Modulate the data applying 64-QAM as specified by MIL-STD-188-110B, and output constellation symbols of single data type. 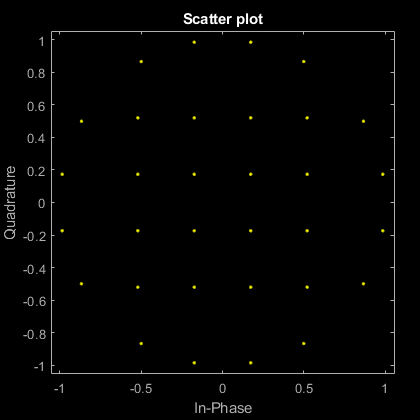 Plot the result constellation using a scatter plot. Input signal, specified as a scalar, vector, or matrix. The elements of x must be binary values or integers that range from 0 to (M – 1), where M is the modulation order. To process input signal as binary elements, set the 'InputType' value to 'bit'. For binary inputs, the number of rows must be an integer multiple of log2(M). Groups of log2(M) bits in a column are mapped onto a symbol, with the first bit representing the MSB and the last bit representing the LSB. Modulation order, specified as a power of two. The modulation order specifies the total number of points in the signal constellation. Input type, specified as the comma-separated pair consisting of 'InputType' and either 'integer' or 'bit'. If you specify 'integer', the input signal must consist of integers from 0 to M – 1. If you specify 'bit', the input signal must contain binary values, and the number of rows must be an integer multiple of log2(M). Output data type, specified as the comma-separated pair consisting of OutputDataType and 'double' or 'single'. Unit average power flag, specified as the comma-separated pair consisting of 'UnitAveragePower' and a logical scalar. When this flag is true, the function scales the constellation to an average power of 1 watt referenced to 1 ohm. When this flag is false, the function scales the constellation based on specifications in the relevant standard, as described in . Option to plot constellation, specified as the comma-separated pair consisting of 'PlotConstellation' and a logical scalar. To plot the constellation, set PlotConstellation to true. Modulated signal, returned as a complex scalar, vector, or matrix. The dimension of the output depends on the specified InputType value. 'integer' y has the same dimensions as input x. 'bit' The number of rows in y equals the number of rows in x divided by log2(M). MIL-STD-188-110 is a US Department of Defense standard for HF communications using serial PSK mode of both data and voice signals. The standard specifies physical layer modulation schemes for tactical and long-haul communications. The modulation scheme specified by the standard is a mix of QAM and APSK. For a detailed description of the modulation scheme, see . MIL-STD-188-110B & C: "Interoperability and Performance Standards for Data Modems". Department of Defense Interface Standard, USA.